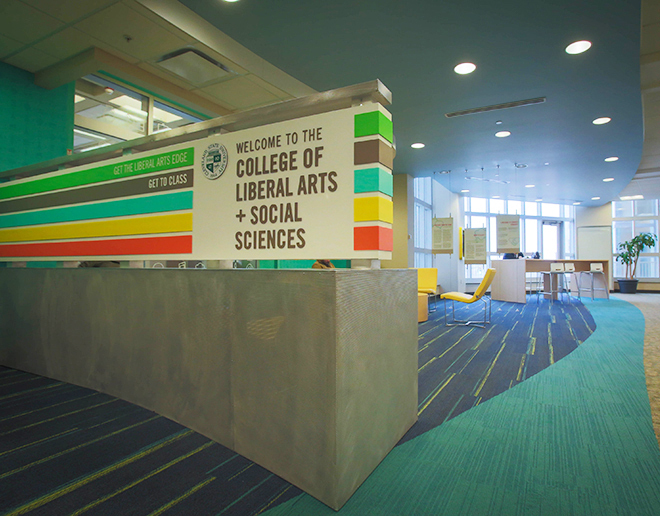 The lounge is a focal point for the College of Liberal Arts and Social Sciences (CLASS), whose departments and offices can be found in multiple locations across campus. Here students, parents, and visitors can learn more about the work of this complex college, which houses twelve departments and schools as well as several interdisciplinary programs in the fine arts, the humanities, and the social sciences. The college is a hub of exciting activities in such areas as theatre and music, philosophy and comparative religion, communication and economics. While great literature and art find a place of honor in our halls, group structures and social challenges also engage our attention. In short, studies of human diversity, language, history, and creativity center our efforts.